Cedric Magen labels samples in the long lab. 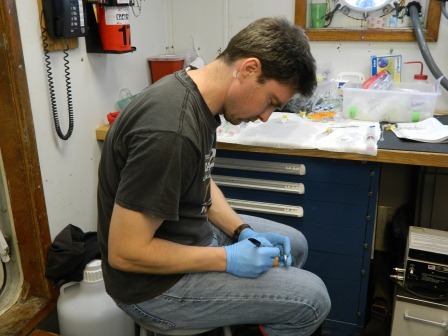 Cedric Magen is on board the Weatherbird II to collect water samples and conduct tests that can be utilized to further his research to help understand the distribution, role, and cause of methane in the oceans; specifically the Gulf of Mexico. Scientists have known for years that methane concentrations increase at about 50-100 m depths below the sea surface, in well oxygenated waters. However, methane is typically produced in anoxic environments. Scientists have investigated this paradox for a few decades now, but so far, have not been able to explain it. 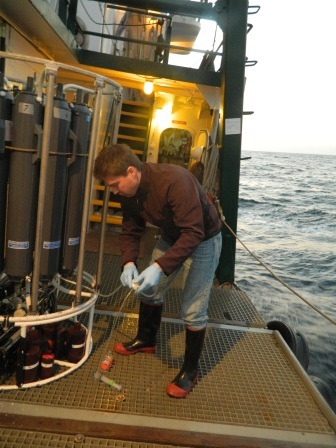 Methane is typically produced by methanogens, microbes in sediments. It will sometimes escape the sediment to the overlying waters , leading to high concentrations next to the sea floor. It can also be released from natural oil seeps, at the same time oil is released. These deep sources of methane cannot explain the methane peak at 50-100m, simply because methane coming from the sea floor is oxidized before it makes it to the sub-surface waters. Scientists have come up with several hypothesis for this peak (e.g., by-product of zooplankton metablolism, presence of anoxic micro-environments associated to marine particles where methanogens could grow, etc. ), but have not yet been able to demonstrate these hypothesis in-situ. Cedric on deck collecting samples from Niskin bottles. Cedric has been busy collecting methane data that will be used in a model to try to correlate methane distribution with other parameters collected on board. As Cedric stated to C-IMAGE Teacher at Sea, Matt MacGregor, “What you see me doing now is the easy part. Now I have to go to the lab and try to come up with an explanation for the vertical distribution of methane in the Gulf”. Print article This entry was posted by greely on February 10, 2013 at 11:29 pm, and is filed under Oceanic Updates. Follow any responses to this post through RSS 2.0. You can leave a response or trackback from your own site.